These leaves are carefully collected from my very own resurrection plant. I have collected these plants for over a decade now and care for them like children! This plant is known scientifically as "Anastatica hierochuntica", which grows naturally in northern Africa and southwest Asia. These plants have the remarkable ability to survive in a curled up, dormant, brown, lifeless state for years, and then unfurl, and turn an emerald green when placed in a half inch of water. After rehydrating, they go dormant again when their water source is removed, and can be revived again after dormancy. This cycle can be repeated for years. 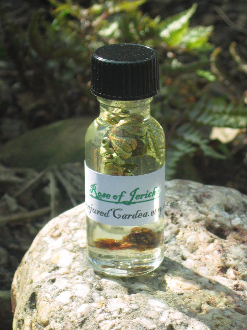 Because of this astounding characteristic it has been called the resurrection plant, Jerusalem rose, dinosaur plant, conjure weed, and rose of Jericho. It is attributed with various magickal properties and is one the best house hold and self purification ingredients I know of.